September 25 - October 1 is Banned Books Week. Banned Books Week is an annual, week-long event celebrating the freedom to choose what we read. Every year the American Library Association publishes a list of the most frequently challenged books in the United States. A challenge is a formal request to remove a book from a library or school curriculum. This year, the theme of Banned Books Week is diversity. The ALA has noted that in recent years, a disproportionate number of books on the challenged list contain "diverse content". Diverse characters are defined as: "those who may experience language or literacy-related barriers; economic distress; cultural or social isolation; physical or attitudinal barriers; racism; discrimination on the basis of appearance, ethnicity, immigrant status, religious background, sexual orientation, gender identity, gender expression; or barriers to equal education, employment, and housing”. The library has put together displays both inside and outside the library featuring books on recent and historical frequently challenged lists, books featuring diverse characters, and books that are now considered "classics", part of the modern canon, that have been challenged or even out-right censored in the past. Come to the library to see just what it is that some people think you shouldn't be allowed read! *Jacoby, Maggie. 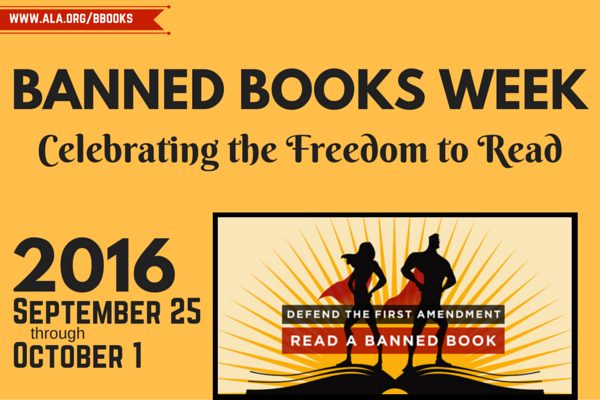 “Why Diverse Books Are Commonly Banned.” Banned Books Week, 22 Sept. 2016, http://www.bannedbooksweek.org/node/10261.